Shirdi Sai Baba Stories,Leelas and Teachings. 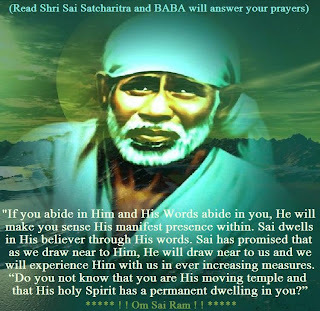 : Shirdi Sai Baba's Grace-Experience Of Sai Devotees-Part 54. 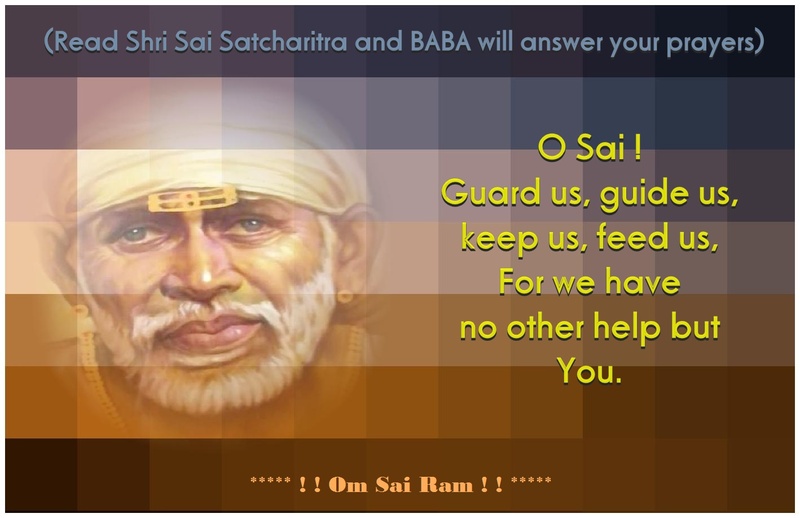 Shirdi Sai Baba's Grace-Experience Of Sai Devotees-Part 54. Today's experiences shares about Baba's love for the devotees.Our Shirdi Sai Baba is the Abode of Mercy ,HE is deeply affectionate towards His children and is always by their side in the time of need. He is present in every atom of this universe be it animate or inanimate.And HE can be seen and witnessed by those who sincerely pray ,desire for HIS darshan and have immense faith on Him.Sai Baba is the only helmsmen in today's time for His bhakta ,by His mere darshan,He does away with fear,problem and pains of human's worldly life .Jai Sai Ram . It has been a long time since I wrote to you. Hope you and your family are doing well with Babas Grace. I regularly enjoy reading the experiences of all devotees here and I thank Baba and you for all the good work. Today I would like to share a very beautiful experience I had and how I learnt the importance of Babas Aratis. Baba has been teaching me the values of diciplined prayers everyday. He taught me the value of Babas aratis last week. Over the past couple of years my husband had missed his regular health check up from office due to some thing or other. I have been bugging him to go for a health check and he kept postponing it because he thought it was time consuming and since he felt well he need not bother about it. But this was worrying me to the extent of making me have sleepless nights. You take care of his health now.I said this and kept calm. Strangely, my husband came home early on the same day evening. He was going about his work as usual and taking some calls etc. I was sitting in the room reading sat charita and he asked me why I was dull. I told him how can I relax when you wont do the health check up as it has been over 2 years now. I told him at least you could check the bp in the monitor I have at home. Surprisingly he agreed and checked his bp. To my horror it was 181/111! I was shocked and asked him to relax and checked again. It came down to 160/98 and remained there. I couldnt believe this and told him that he should see a doctor the very next day. He too got worried and scared and agreed. The next day, I did the regualar abhishekam for baba and we both went to the doctor. I thought that I will come back and start my aratis. I kept praying all the while. We had to run to the doctors office as it was raining and we did not want to get wet. As soon as we went the doctor checked his bp and found that it was much lesser and it is normal after running and coming there. He also did a complete check and blood test and told he will give the result the next day by mail. I came back and did the aratis with full faith. We did not get any mail from the doctor and I was beginning to worry. But, on SAturday the doctor himself called us and told that everything is very normal and he is fine. Isnt it strange that the doctor himeslf calls to tell everythng is ok! !Baba made me do all the aratis for the entire week and gave me a lot of peace of mind. To top it off, today, thursday, exactly a week of performing aratis, I get prasad from Shirdi who returned to Japan from India. What more can I ask? Babas aratis are so powerful and chanting it is the miraculous healing we all need.Thank you Baba. Sorry for the long post. I'm not sure if my experience is worthy enough to be recited in this forum, but I want to share my experience with all Sai Ram devotees. A little about me and my relationship with Baba: I always had the presence of Baba around me since I was a child, I knew that there was something very special about him but I was not a devotee, I believed in him and his powers but I did not worship him. In 2012 after a year of suffering and depression a friend of mine told me about Sai Vrat. She told me how it was very easy to do and how powerful it was, she herself had kept the fast as her parents were not ready to get her married to her boyfriend, but on the 9th Thursday they called her and said they were ok with the marriage, similarly another friend of ours had good results on the 9th day of the Vrat and even her parents agreed to get her married to her boyfriend ( JAI SAI RAM !!! ). So keeping some hope I started the Vrat too. I had a wish that I needed Sai to fulfill but around the fifth Guruwar I asked him wholeheartedly that all I wanted was happiness in my life. It was around this time that Sai introduced me to the greatest happiness- True Love. Before the fast was over this guy proposed to me (things were moving very fast) and I said ok to him. On the 9th Thursday I happily went to Sai Maharaj's temple and asked him to give me a happy life with this guy. A year went by and I visited Baba only once during this time (and the guilt is killing me everyday. Soon after this incident we started things started getting very shaky and one day my boyfriend said that he could not go on like this anymore, my anger issues were ruining our relationship. It broke my heart I begged and pleaded him to give me another chance but he said he had already given me three chances. It was the last time he spoke to me, my mom tried talking to him and telling him I would change, but it was of no use. 1) everytime I feel low or anger creeping up, I see Baba as if he's trying to pacify me, it makes me feel bad and chant his name . 2) When I think of good times with my boyfriend again I see Sai as if he's trying to reassure me that he's trying his best to bring that love back. 3) One day on the road I saw no vehicles with Baba's sticker/picture, on the same day a girl had returned to the office after her wedding, something made me look at her hand and lo, she had a small Sai ring but the picture on the ring was as clear as day for me . 4) Another incident happened where I did not have Sai darshan, when I entered office they had shuffled our seats and I saw that the girl who sits behind me (from another team) had a photo of Sai on her desk, I couldn't help but smile at his Leelas. 5) Right next to my office they had started building a temple, after I came back from a 2 week long vacation there was some progress in the temple work when I glanced at it I could not believe my eyes, they had completed 2 rough statues of SAI BABA on the temple (once it is finished I will have a temple right next to my office YAYYYYYYYY) . 6) During the vacation I was feeling bad that I could not go to Baba's temple on the Thursdays since the place I was staying at is a small village, so I had to do the pooja with the Baba picture on my phone, I asked my mom if we could go to the nearby city to visit the temple, but no one knew the directions... then out of no where my Mom asked my aunt that few years back she had seen a small silver Baba idol and yes she still had it. My aunt lovingly gave it to me saying it belongs to her daughter but I needed it more than anyone else (It is said that a god statue of the god we believe if given by someone else is even more powerful). 7) there is a contest on the radio station that I listen to everyday, I have never taken part because every time I call the station I don't get my calls through, so I was just dreaming what would happen if I did get to participate and how I'll win it easily during this daydream I saw Sai's picture on a Car, I ignored the sign and carried on dreaming again another picture of Sai came in front of me this was smiling widely as if saying "go ahead participate" so I did call up the station, my call got through on the 4th ring and not only did I participate but I also WON :D... Sai Ram made a small dream come true. I might be reading too much into it, but it made me happy and I know that is what Baba wants There are so many more signs that I have seen these past few weeks that it amazes me. 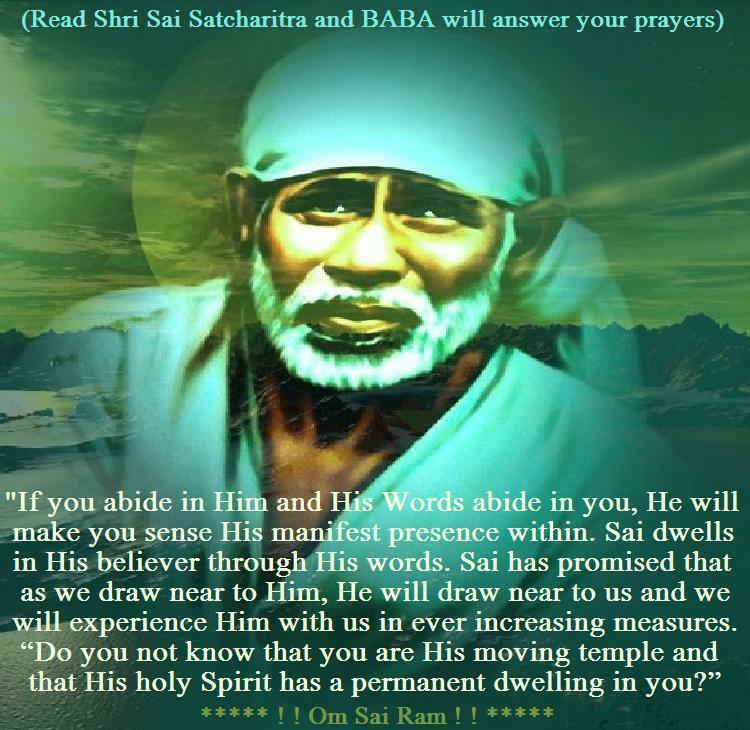 I'm not sure if my boyfriend will come back and the uncertainty depresses me, but in my heart I know Baba is there for me and he will try his best for me Some days I feel very happy just knowing that I have learned my lesson and have reconnected with Sai Maharaj again. Awesome experience.. Your dream will definitely come true. Ur love will surely come back to u. Have faith n patience n trust on Baba.